Fantastic newer construction 3 bedroom, 3 full bathroom, bi-level condo with over 1, 650 sq ft of living space, a large private roofdeck, PARKING and tax abatement remaining. 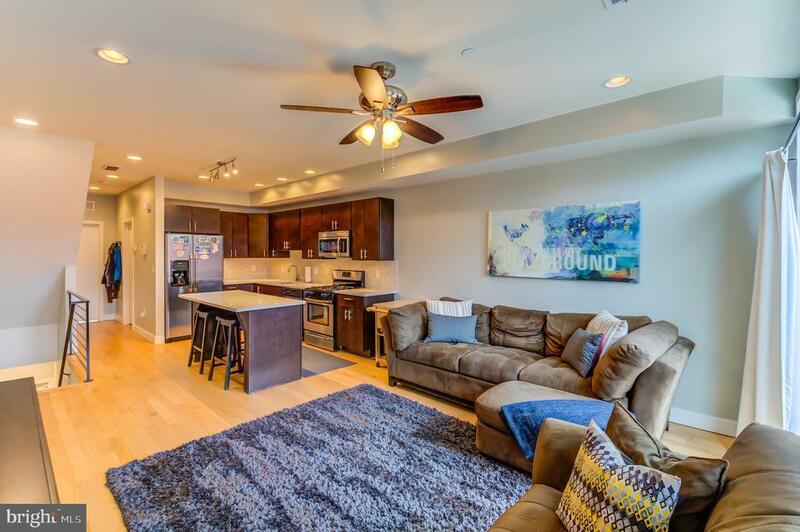 This condo has an optimal open kitchen and living area layout, perfect for entertaining, and hardwood floors throughout. The open kitchen has a large center island that acts as a dining table and additional counterspace, soft close cabinetry, quartz countertops, stainless steel appliances and gas cooking. The living room has glass sliding doors leading to a balcony allowing fantastic natural light. Down the hall is a full bath with custom tile and a modern vanity. This floor also has a spacious bedroom with a large closet. Upstairs has a large master bedroom with high ceilings, skylights and a large closet. The master bath has a stall shower with a modern showerhead and custom tile. The third bedroom has a large closet and an en-suite bathroom with a tub. This floor also has a conveniently located washer and dryer off the hallway. Continue up to the fabulous roofdeck with amazing Center City skyline views perfect for entertaining and enjoying Art Museum fireworks! (all roofdeck furniture and grill included in sale) The parking is conveniently located in the back of the house off George St. Located in the developing Francisville neighborhood, just a short walk to Fairmount Ave and all it has to offer! Bache-Martin school catchment.